While DnD is inspired by a great many fantasy stories, through the decades it has become a genre of its own and has now become inspiration for new fantastic stories. As part of this evolution, certain key elements of the game became popular in their own right. Vecna the Lich, god of hidden knowledge, is one of them. 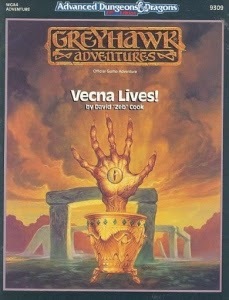 Vecna is from Greyhawk the location of one of the game's creators, E. Gary Gygax, campaigns. He's an evil wizard who became a lich (an undead evil wizard), who eventually became a god. Yeah, he's a Big Bad of the game. But while you don't encounter Vecna very often (one hopes), you may at some point come across his lost his hand or eye (and if your prone to practical jokes, his head). Which if adventurers find can give them incredible gains in power (and probably some attention from Vecna). Which is a key part of DnD, exploring dark places, finding enemies, killing them, and taking their stuff. And in this case, involves cutting off your own hand or putting out your own eye to replace both or either with Vecna's counterpart. Part of the genre DnD created in fantasy was the above notion and the eye and hand of Vecna are amongst the purest examples of it.